Well, it is raining buckets here in Melbourne, the birthplace of (very soon to be) Saint Mary of the Cross (aka Mary MacKillop). God must be very confused at the moment: for years we have been praying for rain, but not a few are now praying for fine weather for Sunday’s festivities (see here for full details). Still, wouldn’t it be a nice thing if on Sunday all Josephite sisters were to dust off the old habits and don them in honour of the canonisation of their founder? 37 Responses to "Sisters" of St Joseph? … wouldn’t it be a nice thing if on Sunday all Josephite sisters were to dust off the old habits and don them in honour of the canonisation of their founder? Assuming they still have them, David? I suppose we could all dress up in the clobber of the 1860s if and when we attend any of the ceremonies. For those interested, you can find out what’s happening in Adelaide and Penola here. Ah, well. You know us, Tony. We’re not just into dressing up in funny clothes, as the bishop said. As soon as I saw numbers 3 and 4 on the right I realised that this was a group of actors.,or else the cast of Australia’s next top model had all decided to take vows of poverty,chastity,charity and humility . Well, if AFL teams can have heritage guernseys . . .
For all the cynicism (or however you like to call it) in your post, I acknowledge you have a point here and freely admit that personally find the whole canonisation of Blessed Mary to be perplexing and to tell you the truth, it does not do much for me at all. Before I start, I acknowledge that I have a direct association with the Sisters of Saint Joseph. My now deceased aunty (God Bless her soul) was a member of the Sisters of St Joseph here in Tasmania until her death in 2003. My aunty entered the convent at the young age of 16 during the 1940s and lived through the turbulent times of the 1970s when such oddities as the discarding of the habit took place. My aunty was not one of the ‘rebellious Nuns’ and was faithful to her vocation until death. However, she did totally discard her habit (albeit gradually) until she dressed completely secular towards the end of her life. Interestingly, I am told she did originally resist this ‘fashion’ until she eventually ‘gave in’ in the late 1980s. My aunty also had an influential role in the order, being the well-known Archbishop Guilford Young’s secretary and cook for twenty years and this position came with some prestige within the community (having anything to do with the Bishop actually meant something back then). The reason I share this story is that I was often exposed to many aspects of the Sisters of St Joseph early in my life. Having a family member from the order meant that my family was in constant contact (including going to endless SSJ functions – zzz) with many other members of the Sisters and my own family were considered the Sisters special friends and part of ‘the Josephite extended family’. Anyhow, the reason that the canonisation of Mary Mackillop means little to me is that a great proportion of the sisters that I grew up admiring are now pretty much dead and absolutely no-one has or will replace them. Where I live, the Sisters of Saint Joseph simply will not exist in as little as ten years time– to the dustbin of extinct species along with the Dodo. This has me thinking – why on earth would I be happy about the canonisation of a woman who founded an order that quite simply will not exist in ten years time and quite simply have no productive or relevant mission for the church anymore? Usually a canonisation has some sort of hidden merits or inspiration such as to honour the order the person belonged to and help that orders mission. What is the point of making a fuss about a person who’s religious order will not exist very soon? The Catholic Church in Australia for the future will be one where the Sisters of Saint Joseph are simply a relic of the past. Most Catholics are not stupid either. Behind all the media attention and portrayal of Mary as a Australian legend along the lines of Don Bradman, a good proportion of practising Catholics make cynical comments of the Sisters of Saint Joseph being irrelevant ‘feral nuns’ who completely lost the plot in the 1970s and now quite rightfully face exterminated. The story of Mary Mackillop has aroused some inspiring stories such as the story of Sophie Delezio and I am sure her feast day will become a good annual feast for the Church, but for the life of me I simply can’t be overtly inspired about a religious order being in the spotlight that sadly represents everything that has gone wrong with the Church over the past forty years. I have just been to one many Church events in my time, where there are ‘big crowds at the Cathedral’ and everyone makes a big hoot and fuss and it looks so good for the visiting media – but in reality the Church is a decaying institution (or at least my Diocese), where behind all the glitz and glamour of ‘special events’, few people are genuinely devout or follow the faith. Anyhow, I probably am getting old. I am sure the canonisation will help some people’s prayer lives and give them something to be inspired by. I hope everyone enjoys the events surrounding this once in a lifetime occasion in their own Diocese and it is something they always remember. I think we need to be clear that the Church is canonising Mary MacKillop, not the order she founded, Gareth. And we can’t hold Mary responsible for the things that have happened in the last forty years! True, but it is also wise to remember a saint and their order go hand in hand and the order’s flourishing is traditionally taken as a sign of God’s blessings. Canonising a saint says to me that the Church approves of that order and wants it to continue its good work for the Church. Do you really think the Church would canonise St Alphonus if the Redempotorists wear rebellious little things? If the Jesuits had no vocations, would the Church had looked upon Saint Ignatius in the same light? Would the Church have raised St Josemaria to the altar if it did not think Opus Dei had a worthy mission/aposolate for the Church? What I was trying to say in the above is that I find the whole process of Mary Makillops canonisation rather odd in that it seems to have invoked and inspired people’s interests in making musicals or stage productions about her, or making her into an ‘Australian icon’ with Phar Lap and all sorts of oddities where the heart of the matter is all swept under that carpet: ideally these great events should inspire the SSJ to carry out its mission more zeal – which is all a bit hard when that order is on the brink of self-destruction. The question of the wearing of the “habit” is an interesting one. There is nothing to say that the habit of a religious order can not and should not be altered. After all, when habits designed for the Northern European climate are brought to Australia, a good deal of suffering and hardship was needlessly afflicted on the Sisters. But common sense, including a good commercial common sense, should have dictated a modification which retained the essential identity of the old habit while making it more apt for modern conditions. The effect of the abandonment of the habit (I don’t regard a broach as a habit) has, in my view been catastrophic just as the abandonment of distinctive clerical clothes (again a cross doesn’t do it as many laypeople wear crosses too). It seems as if the Church has gone underground, is no longer visible in the way she once was. So it is not a surprise to me that the abolition of the habit (which seems to have gone hand in glove with the embracing of a ‘comfortable’ lifestyle – convent out, well appointed flats in) has not brought with it increased respect or an increase in vocations. The reverse seems to have happened. It can’t all be blamed on the loss of the habit per se. It is more what the abandonment of the habit signifies as an attitude to the religious life. If the religious life is not counter cultural, why would you bother to get involved? The most sadiest thing about it all is that priests and Nuns actually look better and more dignified in clerical wear and look grubby and out of fashion wearing a jumper with a cross hidden somewhere. If I was to dedicate my life to a vocation, why would I want to hide this or pretend that I didnt have a vocation? Our Lady at Fatima said God has no fashions. Clerical dress has been as much subject to ‘fashion’ as other forms of uniform or clothing. Should all priests, for example, try to look like their patron, Jean-Marie Vianney? I’m not sure when distinctive clerical garb appeared, but I don’t hear anyone suggesting that it was necessary, or even desirable, for Jesus and his Apostles. Disclaimer: I have no objection to clerical garb, but I do not think not wearing it is a sign that someone is hiding or pretending they didn’t have a vocation. If the Pope was to appear dressed in a wooly old jumper or a business shirt with a tiny little cross on the sleeeve, would you recognise him or what would you think of him? Yes, I would recognise him. What would I think of him? Depends on the context. But we’re not talking about the Pope, are we? Surely, you don’t want priests to dress like the Pope … do you? But my point is that surely we should expect our religious to wear SOMETHING that distinguishes them from the rest of the population (besides a useless cross on the sleeve). If a fireman or policeman didn’t distinguish themselves from the rest of the population, there would be outrage. Why not the same standards for priests? The attitude that priests should try to be like the rest of the population just doesn’t wash anymore and it just doesn’t work. They should show a bit of pride in their vocation. Careful there, Gareth. Already I hear the crackle of the Holy Inquisition’s flames licking about your feet! If the Holy Inquistion wants to stoop so low as to defend priests identifying their vocation by wearing a 1 c.m. minute thing on their sleeve that one could only see if you get a microscope out – then bring it on. Biggles, fetch the … cushions! You dont have much idea do you Tony thinking that a priest dressed in track pants or shorts just to ‘get with the times’ would inspire men to the priesthood. How many Sisters with their permed hair and flowery blouses have inspired young women to take up religious life? There is a book at the library called Catholicism for dummies that might suit you Tons but it might be a bit advanced. Thanks for the insight into your reading list. No! No! Not the comfy chair! I am starting to worry about you Tons? mmm … let me think … maybe because they’re not firemen or policemen? Didn’t seem to be an issue in Jesus’ time. I think humility is much more important for this vocation. Gareth: Because they have been chosen by God amongst the multitudes to dedicate their life to Him and therefore the Church should treat clerical dress as a badge of honour that their clergy are not off this world, but symbolically represent and belong fully to the Lord. A priest once told me that sometimes when he wears a dog collar in public, he is identified by members of the public and they are moved to ask the priest to atke their confession – could this ever happen if they were in clerical or lay dress. Anther priest that I know of who has never stepped out in public in his fifty years as a priest without clerical dress told me that the day he is ashamed to belong to the Lord is the day he will stop wearing his clerical attire – what a beautiful witness! Because they have been chosen by God amongst the multitudes to dedicate their life to Him and therefore the Church should treat clerical dress as a badge of honour that their clergy are not off this world, but symbolically represent and belong fully to the Lord. It’s what follows the ‘and therefore’ that I have a problem with. so according to you – how should priests and religious dress. Because if you give an answer along the lines of ‘as they have done over the past thirty years’ – surely this has already failied. Remember it is the year 2010 – we should learn from our mistakes. “The Church must always seek to make her presence visible in everyday life, especially in contemporary culture, which is often very secularized and yet sensitive to the language of signs. In this regard the Church has a right to expect a significant contribution from consecrated persons, called as they are in every situation to bear clear witness that they belong to Christ. First thing, Gareth, I’m sorry to hear about the tough times you’ve experienced recently. I wouldn’t be proscriptive about it. How they dress is much less interesting to me than how they act. Depends on your definition of success I suppose, but mine has very little to do with appearances. I’ll defer to your recent position on the personal views or ‘recommendations’ of Popes! No-matter what one’s faith background, experience or beliefs – it is always a challenge to trust in God. My one of my aunts also was Sister of St. Joseph and she wore the habit until she died in the 1980s, resisting all attempts to take it away. She was a woman of transparent and luminious goodness and for her, and for all the other holy Josephite nuns who will never be canonized but are nonetheless saints with God, I will rejoice on Sunday. Despite my negativity about the SSJ order in its present form, after some deep prayer and mediation, I join in the chorus that the raising of Blessed Mary means and does something for me. Over the past two to three years, my involvement in the Catholic Church has been a somewhat miserable experience and has shaked the very core of my beliefs. My own church that I loved so much was closed down, I have lost two of my relatively close Catholic friends to suicicde, one of my best friends who was a devout Catholic marriage broke up and he left the Church and a distant relative whom ‘attended Mass’ that I previously respected had an abortion. Having attended Mass close to daily for five years, I took a look around the Church (full of old people) and asked God what on earth was I doing here or why do I support the Church so much? The Church where I live is dying, so I am not sure what I am doing anymore. But the story of Blessed Mary’s ex-communication (which would have been a heart-wrenching experience) and ability to perserve and fight on gives me hope. This is not a sugar-coated saint, but someone that suffered intense blows throughout her life and remained true. For this I thank God and join in with Australians across the country in which this event brings them renewened spiritual energy and hope. This applies to Catholics as much as anyone, but is all the more noticable during a time of mass Apostasy such as this one. But Christ is still Who He Is. Seems to me that the whole Church in the West is undergoing a severe mid-life crisis. 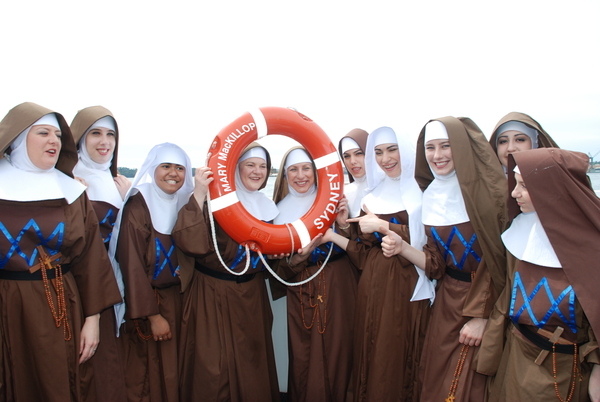 If they did not bother dressing in the habit for the late Pope’s visit to Sydney for the beatification they are unlikely to change their behaviour for the canonisation. The old habits were a cruel pennance in the heat of the Australian summer! Personaaly I would like to see the varied habits of the different orders in a museum in Rome and one simple universal habit for male and female religious be adopted. It could be varied in fabric to suit different climates and be in varied hues to suit the complexion of the wearer. The habit of the grey sisters was a delightfully simple one. Virtually all the teaching orders of nuns have all but disappeared from the post concilliar church. They ditched their habits,disciplines and their teaching vocation and moved into social justice,feminism and earth worship.Needless to say,vocations quickly dried up. I doubt that even a damn good thrashing with the fluffy cushions would have made any difference. I must say that I was disapointed with certain aspects of the religious sisters that gave commentary during the broadcast of the canonisation from St Peter’s. At times, I heard the Nuns (all with their hair dyed of course) ridicule the religious habit and at times it seemed they talked of Saint Mary in terms of a glorified social worker, rather than someone dedicated to God. To make matters worse, the issue of ‘women’s priests’ was even mentioned at times and according to the Nuns this might lead to a inspiration for the Church to re-examine the issue. I honestly don’t think some of the SSJ’s really comprehend that the current situation of their order is quite sad. Apart from that, an uplifting event and it was good to have the opportunity to watch an event in full from the Vatican. I missed that Gareth.Which channel were you watching?I started on Sky News but when they started to ramble on about Mary’s life story during the litany of saints I moved to the ABC’s 24/7 news channel which,to it’s credit,kept commentary relevant and to a minimum. It was a great liturgy though.You cannot beat a Missa Solemnis with all the main prayers sung in latin. The channel I was watching had Paul Collins of all people and another sister, who I could tell was a bit feminist leaning. I suppose they were not that bad, but there were little ‘subtle’ hints as to what I pointed out again, particularly when they were talking about the Nuns from another religious order in a full black habit who were presented to the Holy Father – then the snide marks came. I finished watching it on ABC 24/7 who were pretty good throughout, but the commentators ended the program on the ‘women priests’ question. I listened to ABC radio in the evening and Sister Carmel Pilcher was speaking, eecccchhhhh. Nice liturgies, but the attitudes of some of the SSJ who chose to give commentatary leaves a little to be desired. … then the snide marks came. … and Sister Carmel Pilcher was speaking, eecccchhhhh. Not a hint of irony there, Gareth? LOL – It must have had a rub-off effect on me, although in fairness there is nothing subtle about me.